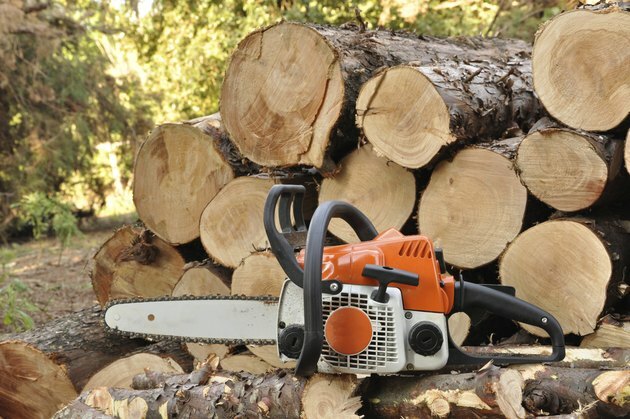 Stihl's MS 290 Farm Boss model was the company's number-one-selling chain saw for several years. The standard model was available with guide bars of 16, 18 or 20 inches, and the saw was equipped with a fully automatic, speed-controlled oil pump. As an option for use with longer guide bars, the unit could be ordered with an adjustable flow oil pump that allowed for simple lubrication adjustments. Check chain oil lubrication every time you use your saw. Flip the chain saw over to expose the underside, while the saw is turned completely off. Adjust the position of the "Ematic" oil flow rate adjustment screw to the "E" marking if it isn't already in that position. This is the oil flow rate preset by the manufacturer. Turn the adjusting screw clockwise, toward the oil drop symbol, to increase the oil feed rate. The saw's chain should receive enough oil to stay thoroughly lubricated and throw off a small amount of oil. Turn the adjusting screw counterclockwise to reduce the oil feed rate. The chain must get enough oil to stay fully lubricated, or the blade and chain can be damaged beyond repair in a short time.